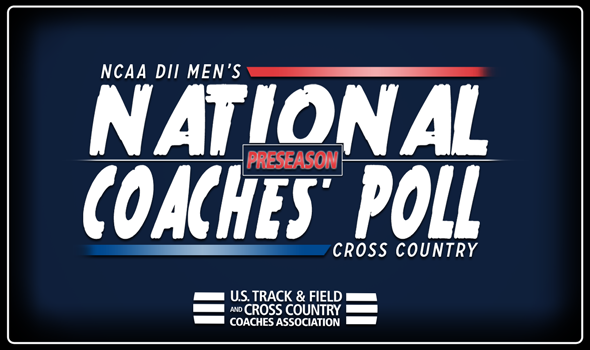 NEW ORLEANS – Adams State, a program looking for its fifth national championship in six years, sits atop the NCAA Division II Men’s National Poll released by the U.S. Track & Field and Cross Country Coaches Association on Wednesday. The Grizzlies won the 2017 NCAA Division II Championships with a 44-point performance and return four of their top five from last year’s team that includes Kale Adams (third at NCAAs), Elias Gedyon (seventh), Joshua Joseph (ninth) and Sydney Gidabuday (17th). Adams State sat as the No. 1 team in all but one national ranking last season and received all eight first place votes in this year’s preseason poll. In total the Grizzlies has collected 13 national titles in the 26-year history of the program competing at the Division II level. The No. 2 rank belongs to Grand Valley State, the nation’s runner up the past two years. The Lakers return one of the best squads in the nation in 2018. The unit has arguably the best 1-2 punch in the country with top returners Zach Panning (second at NCAAs) and Enael Woldemichael (sixth) to go with great depth. Other key contributors look to be Josh Steible and Jake Domagalski. Slotting in at No. 3 is Colorado Mines who is the only program in the past six years to win a national title other than Adams State as the Mines took the top prize in 2015. The team will return its top-four from a unit that placed third at last year’s NCAAs. The squad will be led by Preseason RMAC Runner of the Year Grant Colligan (fifth at NCAAs) with top contributions comings from Logan Ramlet (12th), Ricardo Ocamp (14th) and Josh Hoskinson (27th). Taking the No. 4 spot is Chico State who is looking to improve on its ninth-place finish from a season ago. The team returns an experienced roster that includes Teddy Kassa (79th at NCAAs), Eddie King (84th) and Jack Johnson (189th). Wyatt Baxter and Remington Breeze will also look to help. The Wildcats have advanced to 19-straight NCAA national championships. In No. 5 is Western State who finished fourth a year ago at NCAAs. The Mountaineers are the third team from the South Central Region to be featured in the top-five. They too return a talented group of runners with All-Americans Ahmed Jame (24th at NCAAs) and Ross Husch (25th) while Taylor Stack (41st) will also be a main contributor. The No. 6 selection is Queens (NC), a program coming off a historic season in 2017. The Royals finished a program-best sixth at last year’s NCAAs and will be led by Felix Wammetsberger (44th at NCAAs), Daniel Wallis (47th), and Nick Kipemei (62nd). This is a young and talented group. No. 7 is held by by Augustana (S.D.) who returns an experienced and deep roster that returns four of its top seven athletes. Key returners include Nick Larsen (50th at NCAAs), Aaron Runge (56th), Alec Kray (87th), Sean Heaton (94th) and Jesus Urtusuastegui to go with promising freshman Matt Steiger. The team also gets back a few redshirted athletes that will look to contribute as well. Coming in at No. 8 is CSU-Pueblo who returns five of its top seven runners from a year ago that includes All-Americans Marcelo Laguera (23rd at NCAAs) and Alec Choury (28th). Derrick Williams is also returning after not competing in cross country last season. The Thunderwolves are looking to make their third-straight NCAA appearance. Southern Indiana was picked in the No. 9 spot and will look towards a mix of top returners and newcomers in the form of transfers and recruits to keep it in the mix again this season. Top athletes coming back include Darin Lawrence (91st at NCAAs), Austin Nolan (98th), Nathan Hall, Javan Winders and Jesse Stanley. Rounding out the top-ten in No. 10 is Shippensburg a team that returns five of its top seven from a unit that placed tenth at last year’s NCAAs. The Raiders have an experienced core and will look towards Dominic Stroh (78th at NCAAs), Robert Moser (119th), Sean Weidner (126th), Connor Holm and Brian Latarola to lead the squad. Teams No. 11 to 25 are made up of a mix of familiar programs and ones looking to take new leaps this year. New this season as compared to last year’s final rankings is No. 11 Saginaw Valley State, No. 17 Sioux Falls, No. 23 American International, No. 24 Edinboro and No. 25 Cal Poly Pomona. Familiar programs who were all in the top-25 to end the year last season include No. 12 Mount Olive, No. 13 Western Oregon, No. 14 Dallas Baptist, No. 15 Stonehill, No. 16 Simon Fraser, No. 18 West Texas A&M, No. 19 Walsh, No. 20 Missouri Southern, No. 21 Alaska Anchorage and No. 21 Lee. Also receiving votes was Augusta, Alabama-Huntsville, Western Washington and Bellarmine.